78-69 win over Wright State in the Championship game of the 2016 Horizon League men’s basketball tournament on Tuesday night at Joe Louis Arena in Detroit. 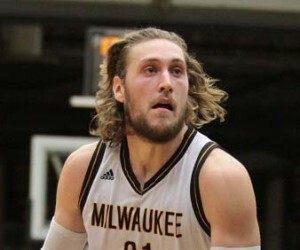 Jordan Fouse had 25 points and 10 rebounds to help fourth-seeded Green Bay pull out a 99-92 upset victory over top-seeded Valparaiso at Joe Louis Arena in Detroit. Alec Peters had 32 for the Crusaders, including a layup at the buzzer that forced overtime. Valparaiso had trailed by six points with less than two minutes remaining. It was all Green Bay in overtime as they jumped out to a 7-2 run and then the Phoenix (22-12) held on for their 22nd win of the season. Charles Cooper finished with 24 points and Carrington Love 23 for the Phoenix. They’ll face Wright State in tonight’s 6 p.m. Championship game. Wright State advanced to the Horizon League Championship game against Green Bay tonight. The Raiders got 18 points off the bench from Mark Alstork in a 59-55 win over second-seeded Oakland. The third-seeded Raiders improved to 22-12 on the year. The winner of tonight’s Green Bay/Wright State game secures the Horizon League’s automatic bid into the NCAA Tournament. 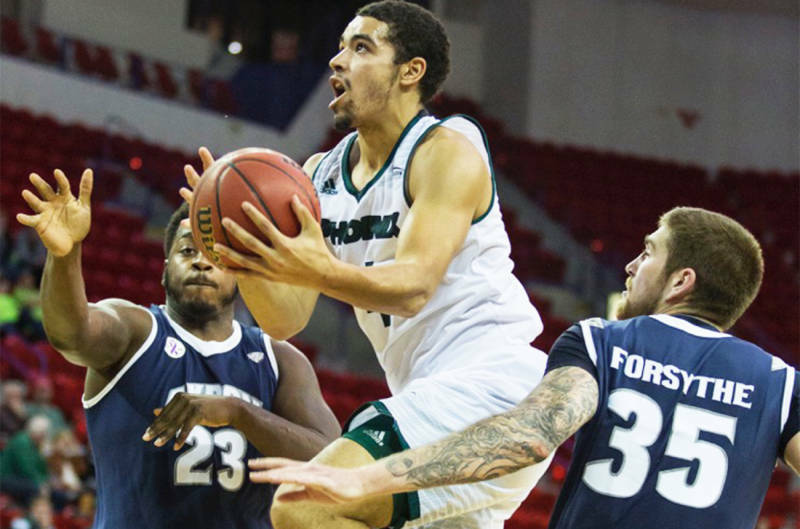 Jordan Fouse recorded a double-double for the sixth straight game and the Green Bay men’s basketball team held off Northern Kentucky 85-78 in Horizon League play on Thursday night. Green Bay (14-9, 6-4 HL) needed some clutch free throws late to seal the win and secure the season sweep against the Norse (8-14, 4-7 HL). After NKU knocked down a three-pointer with 51 seconds left to cut the Green Bay lead to four, Fouse made a pair of free throws and Turner Botz added another to hold off the Norse. Junior forward Kenneth Lowe scored a career high 23 points and pulled down nine rebounds, but it wasn’t enough to prevent the Green Bay Phoenix from falling to 0-2, dropping a 103-90 decision to East Tennessee State early this morning. The matchup was part of the annual 24 hour season tip-off marathon aired on ESPN2. The Green Bay Phoenix extended their winning streak to five games and remained perfect at home for the season, knocking off Youngstown State (9-10, 0-4 HL) 82-67 on Sunday night. Keifer Sykes led the charge for the Phoenix with 24 points and senior forward Greg Mays finished one point shy of his career high 24 points. Mays had 23 points, eight rebounds, three assists and three blocked shots in his best performance of the season. 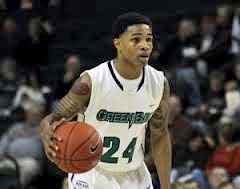 Senior guard Keifer Sykes scored 22 of his career-high 34 points in the first half as the Green Bay Phoenix (13-3, 2-0 HL) built a 20-point lead at halftime and cruised to a 79-63 win over the Milwaukee Panthers in Horizon League play Friday night at UWM Panther Arena. Sykes hit 13 of 20 shots on the night, including 5 of 7 from three-point range. It matched the 34 points he scored against the Panthers in a 93-86 overtime victory on Jan. 12, 2014 in Milwaukee. Green Bay shot 56.7% from the field (17-30) in the first half. Milwaukee hit just 34.8% (8-23). Greg Mays finished with a double-double for the Phoenix (16 points and 11 rebounds), and junior Carrington Love added 15 points for Green Bay. The Phoenix also got eight points, seven rebounds, four blocks and three steals from junior Jordan Fouse (Racine, Wis.). The Panthers (5-12, 0-3) dropped their sixth in a row. They were led by Steve McWhorter’s 21 points and Akeem Springs 18 points. Green Bay returns home to host Youngstown State on Sunday evening (7pm) at the Resch Center.